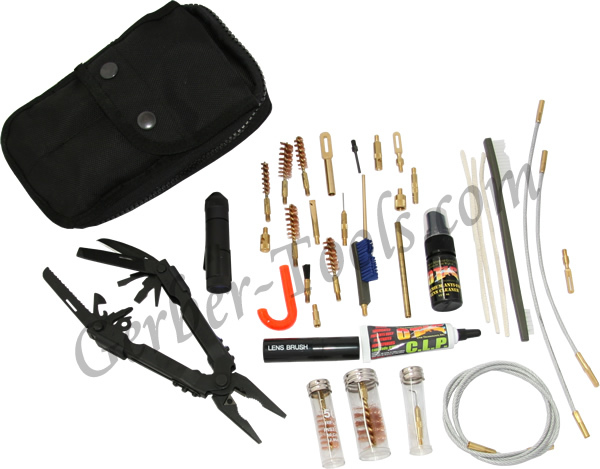 Gerber teamed up with Otis Technology to bring you the Universal Gun Cleaning Kit, model 22-01072. This gun cleaning kit has just about every gadget known to man that can help you clean your gun. A non-reflective Gerber multitool and a Gerber Infinity light with a white led is included for even more convenience. All of this packs together into one heavy duty nylon carrying case. Enlarge the picture to get a really nice view of the gun cleaning kit.